Malala Yousafzai was targeted by Pakistani Taliban gunmen in October 2012 when she was on her way home from school. Yousafzai, who is now 18, has been fighting for years for the rights of girls to get an education, which made her a target for extremist militants, according to the Wall Street Journal. Gunmen stopped her school van about three years ago, asked students to identify her, and then shot her in the head, seriously wounding her. She was flown to a nearby hospital in a coma and managed to live, though the event injured her permanently. She still speaks out about her cause, and refused to give the Taliban power by saying the group's name in a recent interview with Guardian reporter Kate Kellaway. 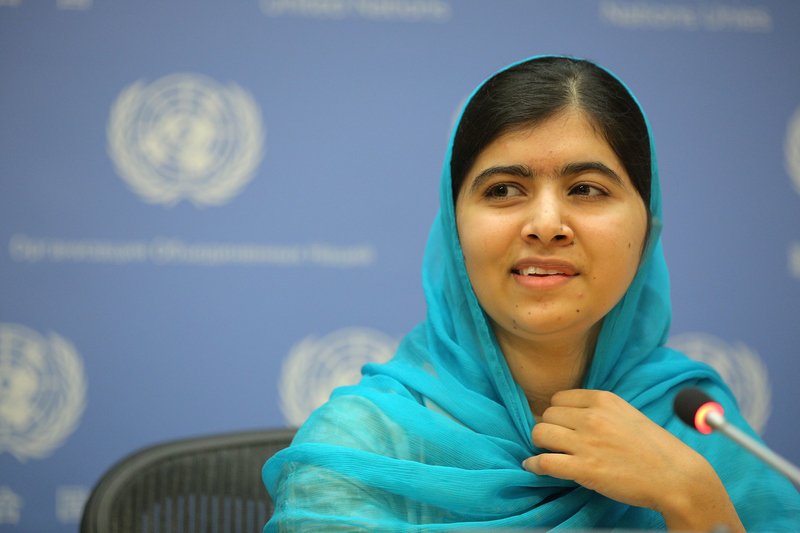 Yousafzai's quotes about the Taliban's attack and her goals show just why she is changing the world. A documentary about Yousafzai's life, He Named Me Malala, was released in the U.S. last month and was just released in Europe recently. Yousafzai's father, Ziauddin, describes their bond in the documentary as “one soul in two different bodies," according to the Guardian. He told the Guardian that he never encouraged his daughter to speak out — but he also never held her back. As a result, he said he blamed himself for her shooting. He felt like he should've tried to keep her quiet. Speaking about the shooting, her relationship with her father, and her political goals, Yousafzai's five most inspiring quotes make it clear that she doesn't blame anyone and that she's not giving up soon. I never like to discuss it because it reminds me of a bad time. To go forward in life, you have to think of the good things, and things have changed, so why think of the trauma, of the pain? It was my 10th day in the hospital. I had no idea where I was or where my parents were, and when I saw my father for the first time and realized he was with me ... I cried as loud as I could. World leaders ignore these issues. They are chosen by people but don’t listen to the voice of people, so how can they call themselves leaders? As our politicians are doing nothing for us, nothing for peace, nothing for education, I want to become prime minister of my country. To some people this seems too much — they feel you can’t dream that way, you must have a smaller dream. But sometimes it’s good to dream bigger. This is what I’ve been telling our world leaders: dream big, make your ambitions bigger. I planted flowers and seeds in it and, right in the middle, a mango tree. ... I’d stand in the garden and look at the stars. Here in the UK I have noticed you don’t really see stars.